Flowers bring aesthetic pleasure and joy to people. Potted flowers create comforts and help us in many ways. They purify the air in house/office/ceremonies, increase air humidity, kill bacteria and reduce electromagnetic radiation. Therefore, folks use flowers to decorate their houses/offices. They also use it to in marriage and wedding ceremonies, New Year's celebration and parties, as a gift etc. So, today, we will discuss 10 Easy Flower Arrangement And Decoration Ideas using which you can easily decorate your house, office, and other areas easily and make people feel special. The decorative bird cage is an important design which brings lightness and tenderness in the environment. Recently, it became quite fashionable as it designers use it as a decorative element and its practical significance faded into the background. Always keep in mind that Fans of vintage tricks are trying to acquire an old or simply forged, but wooden, white, and unusual decorative cage adds more beauty to your house or office and creates a sense of comfort and romance in the atmosphere. Multi-Colored Tinted Water With Flowers adds more beauty to your house or office and make it look more beautiful. To make this come true, you need to have white flowers (chrysanthemums, tulips, roses, chamomiles, carnations), food dyes (dry), suitable jars or vases, water (pre-settled or filtered), and teaspoon Just dilute food color in 1/2 tsp. warm water and add separated water for flowers. Get suitable vases or jars and paint chrysanthemums. You need to put each flower separately in a vase and add colored water. Cut flower stem at an oblique angle, put flowers in a vase and wait about a day until they are painted. You can also purchase painted Milano flowers online for home or office decoration. Always keep in mind that Original landscape decorations are expensive if you buy them in stores and order online. Just show some imagination to make a non-banal decoration. It will not cost a single penny. Use an old watering can and other unnecessary things to decorate it with flower and increase the overall beauty of your house and office. It will help you to dispose of the remnants of unnecessary things and turn the garbage into charming and quite functional summer decorations. 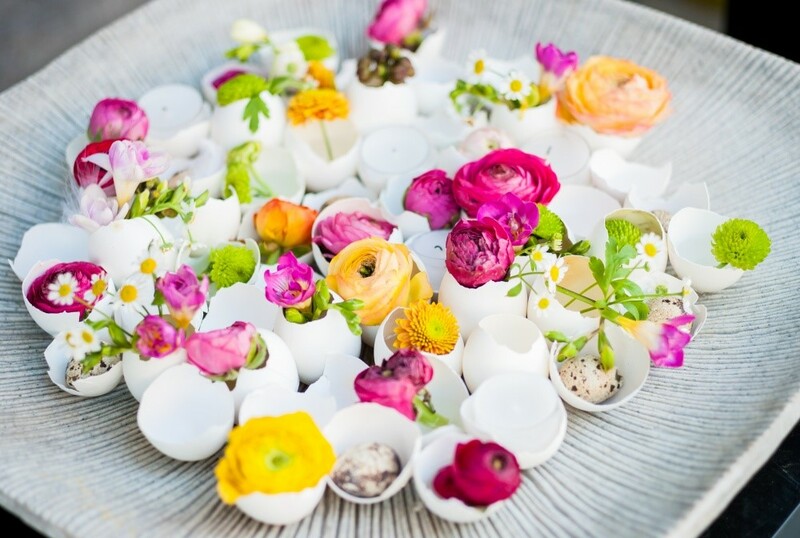 Egg shells can be used to decorate certain areas of houses and offices with the help of flowers. You can do this in many ways as per your needs, the availability of free space in your house/office, etc. You can use the wooden box to plant flower trees and keep them at appropriate places in your house or office to increase its overall beauty. Take a wooden box, install soil in it and sow and flower plant. After some days, the plant will develop fully and add more beauty to your house. wooden shelves with flowers in pots on the wall fit perfectly into the interior decoration of the house. The bedroom is an important place in your house for rest, recreation, and sleep. So, flower decoration in the bedroom lets you have a feeling of romance, peace, and aroma. You can resort to the best online international flower delivery service to get fresh Milano flowers for bedroom decoration. All folks must keep in mind that herbs or small flowers planted in a basket create a cozy and homely atmosphere in your house, office, parties, and special celebrations. To keep flowers fresh, a special sponge-like material with impregnation is placed inside. A bouquet in white and red colors is combined with a sweet vase of lollipops of similar colors. A Candy should be attached inside or outside. Keep it out of the reach of children as they will break it carelessly. Alternatively, instead of candy, you can use colored pencils or paint brushes. You can place flower bouquet at any place in your house and make it look more beautiful & attractive. Furthermore, Broken or withering flowers can prolong life by placing their buds in a shallow glass or ceramic bowl with water. Always remember that floating buds of roses, chrysanthemums or gerberas will keep an attractive appearance for a long time and smell good. Bright flowers, when placed in tea or coffee cups, cheer up and decorate a small tea party. Your party is filled with romantic emotions. You can grow herbs, cacti or home plants in a small dish. Different flowers help you to decorate your house easily & effortlessly. They generate the feeling of love and romance and spread good aroma at all the times. 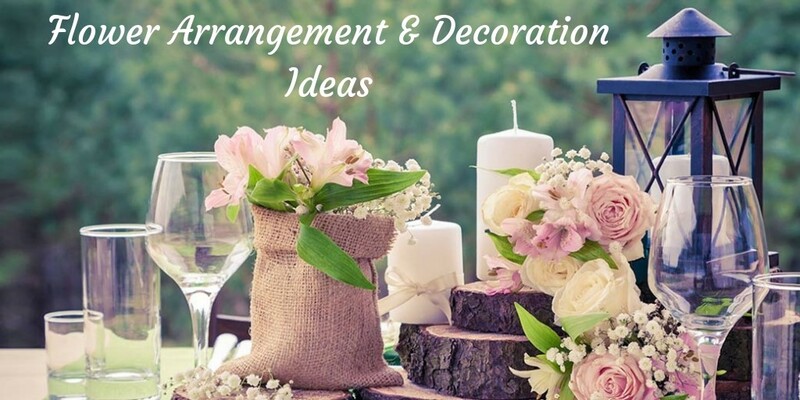 Use these flower arrangement and decoration ideas to add more beauty to your house, office, celebrations, etc. Author Bio: Stella Wilson works as a writer for LolaFlora which is known for best online international flower delivery. She is highly dedicated towards her work and spend most of her time in research of different kind of species in flowers. In her free time she likes to watch movies.